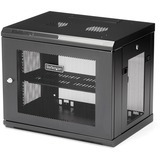 This 9U server rack cabinet lets you mount your EIA-310 compliant equipment to the wall. 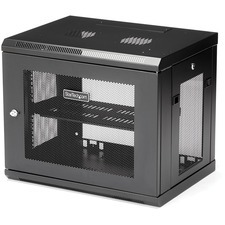 The enclosure features an adjustable mounting depth from 6 to 17 in. and offers a maximum load capacity of 200 lb. (90 kg). The 9U network cabinet features a removable and reversible front door and removable side panels, each with quick-release mechanisms, so you can easily access your equipment. Plus, each door and panel on this rack features an independent lock, ensuring your equipment is secure. The wall-mount server rack also includes all of the cage nuts and mounting screws you'll need to fill the rack with equipment, saving you the time, hassle and cost of sourcing mounting hardware. The RK9WALM is backed by a StarTech.com 5-year warranty and free lifetime technical support.